Abbey Tandoori is a takeaway located on Woodhorn Road in Ashington. 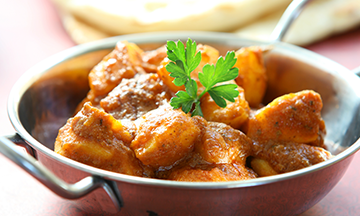 Indian food is delivered straight to your door when you order online. We have such a vast array of dishes on the menu with many options so as a suggestion why not try one of their Malayan Dishes or go for the popular Set Meals option to make ordering quick and easy and are ideal when entertaining. Also on the menu Thali Dishes, Bhuna, Sagwala and Specialities to name just a few items that are available. You will also find Sundries, Bread and Rice to compliment your meal and English Dishes too. Bon Appétit! Excellent service, food is delicious. I would definitely order again. The food was really nice. I would recommend to anyone. One of the best takeaways you'll ever use! Been using them for over 8 years. Never disappointed. Thank you. Beautiful meal and increadibly fast delivery! Will definitley be ordering again! Order online in morning and was delivered well in time. Excellent.